The per head 101 ₹ included train from Dadar-Palghar-Dadar, one healthy lunch, transport from Palghar-Kohoj-Palghar, snacks- cakes, puran-poli, tea and vada-pav. We were group of 6, which means total amount was 606 ₹. Its funny the groups charge 700-800 ₹ for a single trek - single person!! Kohoj fort lies off the Manor-Wada highway, one of the road joining NH8. So reaching Vaghote was very much similar to reaching the village at the base of Asherigad. After reaching Palghar, we boarded Nashik-Nandurbar bound state transport bus going via Manor-Wada highway. Only difference is that, a left turn from Mastan Naka on NH8 will go to Asherigad and a right turn to Kohoj. Travelling in the state transport bus (लाल डब्बा ) for the first time, Kunal felt uneasy at first. But later enjoyed the ride when the driver picked up the speed. Kohoj fort was visible from the bus once it entered the Manor-Wada highway. Kunal's first reaction was- वहा उपर तक जाना है ? We had a hearty laugh. Breakfast at Palghar station turned out to be a perfect move from our side as finding any shops at Vaghote was beyond the realm of possibility. Without wasting a single minute, having set the proper direction on the compass, we set off. The first lake was very much close to the highway. It looked like it was dug out of stone, and the water in it was pretty clean. The byway goes straight to Shelte village. To reach the Pazaar lake, the branch going to the right side needs to be followed till the wall of Pazaar lake is seen. Walk on the wall of the lake was highly exhilarating; the view of the fort, and the lake in its courtyard was appealing. Now, where the wall ends, trail enters the forest, and starts climbing gradually. By the time we reached the first open space on the slope, we were kinda lost. The route looked shaky and unclear. But we kept on following that route, with a vague feeling about this route meeting the main route. It did meet the main route. But before that we had to cross the thorny bushes, heaps of dried leaves, slippery rocks and what not. 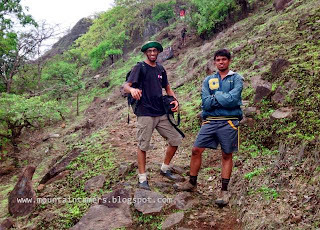 But with all this, Kunal didn't even showed a single symptom of the usual first time trek. Abhash and Tarun were also helping him restore his confidence at times. 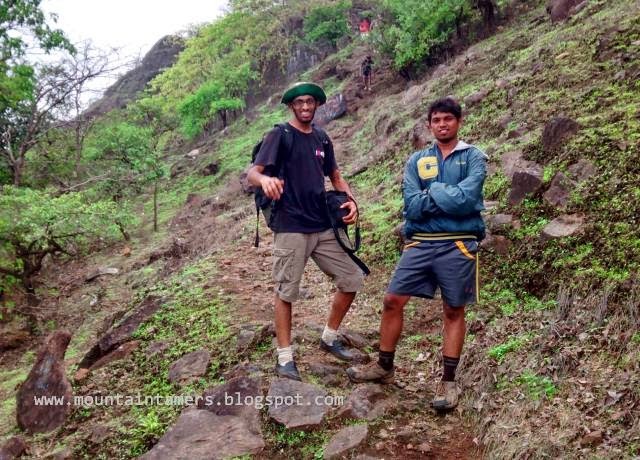 Aaditya and Manoj were helping me find the route. They also helped me to find a Conker-berry bush aka Bush Plum or Carissa Caranda or करवंद tree nearby. After feasting on the juicy fruits, we proceeded to the ridge where Kohoj hill actually starts. We had to climb the dried-up water stream to reach the col (खिंड). The strong winds welcomed us. Also, we found that the correct route was just beside the route we were climbing. Trail after the col was straightforward and the possibility of losing it was null. The forest covered the full route and the dulcet tones of different birds filled the atmosphere. We could locate the remains of the main entrance to the fort. The approach to the top has a few standing remains of the fortification (तटबंदी). The top of the fort is a large plateau having a stone carving, Shiva temple, countable water cisterns, vestige of a standing structure, a naturally formed human-like structure, temple of Lord Hanuman, another stone carving of Lord Hanuman and Temple of Lord Krishna. It was surprising to see a Krishna temple, as it is very rare to see one dedicated to Krishna. 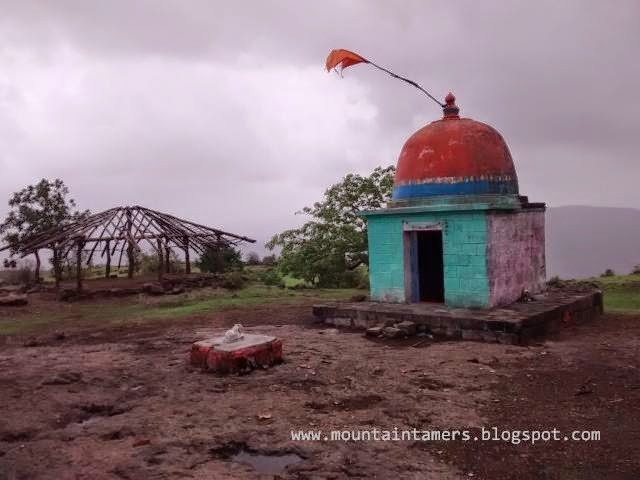 One similar temple (newly built) was spotted on Mangi-Tungi ridge. We had our lunch behind the Shiva temple. Aloo, chana masala were the favourites, khichidi, thepla, puri, pickles were other supporting goodies. 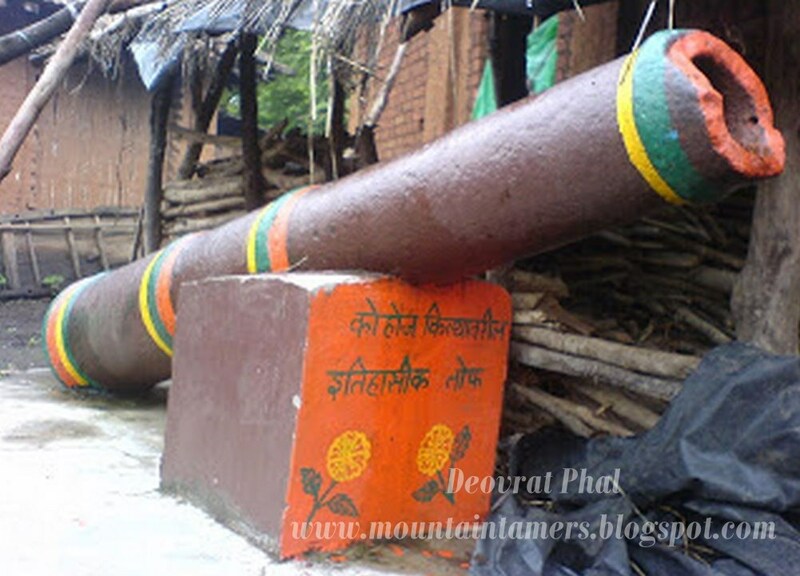 This is a huge man-made water body which provides water to the Shelte Village and adjoining villages. Water from this lake is mostly used by people for washing purposes, bathing and by cattle. At ~4.30 PM, when we reached the lake, we decided to take a plunge into the lake and cool down the body. Before entering the lake, we first ensured that it would be safe for us there, confirmed with a herder (गुराखी) and then set forward to step our foot inside. It was also the usual bath time for the local school kids, and they were too enjoying themselves. An under water route follows upto the middle of the lake. The 30 minutes spent in the lake were assuaging. All the fatigue caused by the days trek had died out and had left us with enough sense of ebullience to finish the remaining trek. We were so very much charged up that we ended up in a wrong village instead of reaching the Manor-Wada highway! A tum-tum dropped us at Mastan Naka (मस्तान नाका) and charged us reasonably. A benevolent tempo-driver also gave us a lift till Palghar railway station. We reached just in time to catch the 7:30 PM, CST bound fast local train. Now it was time for the Kohoj trek to enter the dossier on trekking. Height of Kohoj fort is roughly 3200ft. The village at the base of Kohoj fort, Vaghote, can be reached from both, Thane as well as Palghar. Always consult a villager before taking a swim in the lakes, especially during rainy season (we always do).